Wow! Lot’s going on in this collection. I was a busy guy! There’s also a goof – but I’ll get to that in a minute. Gotta love TJ’s schemes. Makes one wonder why guys are so idiotic sometimes. I mean, guys don’t hold the entire Idiot Deck – women do some crazy things, too. But female craziness is somehow cute and endearing. Guy craziness is usually bizarre, even dangerous. Have you seen any of the “Jackass” movies? See many girls jumping from various high places to land in various unlandable places? No. The trouble with TJ’s plans is that there’s always a tiny sliver of logic in them, just enough to trip up hapless Brad. Check out TJ’s awesome WeenieWorld hat in the 4-16 strip. I didn’t make this up. In a production of my musical, “Luann – Scenes In A Teen’s Life,” the costumer found an actual hot dog hat, just like the one TJ’s wearing. 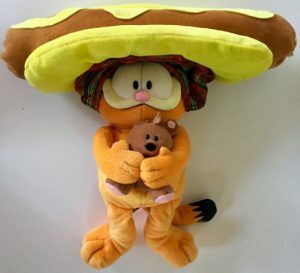 I got to keep the hat as a souvenir and I put it on Garfield (can you believe no one makes TJ dolls?!). Ok, now the goof. Notice which of Ann Eiffel’s hands Shannon bites on 4-19, then note which she’s holding up the next day. My excuse for this blunder? I’m a lefty. We lefties, living in a right-handed world, often get confused. So there.